Many 32xx's came with the Hino Diesel. Hino is a Japaneses company owned by Toyota. They are practically bullet proof, super simple to work on and parts are available at reasonable prices. Mine have been nothing but spectacular; Super fuel efficient, reliable and easy to work on. The only issue I have ever had was a clogged fuel filter. The 32xx hull design features a rounded chine with prop pockets where the props are tucked into. This provides excellent efficiency, but the rounded chine creates a little more roll at anchor and a more then normal "Squirrely Ride" in a following sea. Some have made modification to the hull (Underhulls) which square up the chine creating less roll and perhaps a little more speed . The use of prop pockets removes the need for v-drives and allows the engines to be placed under the cockpit versus the salon like many other vessels of like size. In general, all years 1981-1995 are pretty much the same hull. The differences were pretty much in the engine choices available and the cabinetry/ color schemes used. One thing that's interesting is that Bayliner seems to have used the same color scheme for all the Motoryachts of that year (eg. 1986-87 3270, 3870, and 4550 have the same exterior trim). 1981-1984 3270 models were called EXPLORERS. Most boats of this year range came with gas motors (some version of the marinized V-6). There were a few that came with 90hp Nissan Diesel engines. The ones with Nissan engines are pretty much just trawlers. Maximum speed is around 10 kts and normal cruise is around 8 kts. Unless the previous owner added one, there is no factory radar arch. The flybridge seating is a little different than the later models. The flybridge helm is on the starboard side. The cabinetry is a little different in the galley. These don't have an extra cabinet above the stove (86's and later have a built in microwave). 110 Hino's were the diesel option. Marinized Chevy 305's were the standard engine. In the PNW, more than 1/2 of these year boats have 110 Hinos. The rest of the country seem to have the 305 motors. The gas version is a 15-17 kt cruise boat (3200-3500 rpm) while getting around 0.80 nmpg at that speed. Top speed is around 21-23 kts. The 110 hinos seem to cruise around 10-12 kts. with much better fuel economy (around 2 nmpg) but top speed is much less (14 kts?). Radar arch seem to be a factory option on the 85 models. You see about 1/2 without on Yachworld listings. The radar arch was standard on the 86's. standard on the 86's and on. 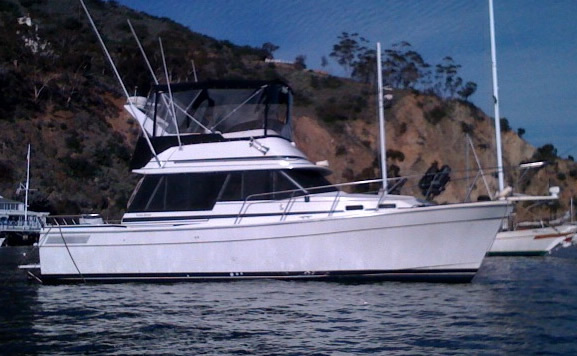 From 1985 and on, the flybridge helm is in the middle of the panel and there is an L-type seat on the starboard side. 135 Hino's were the diesel option with the small block 305 GM's (VP or US Marine) as the gas standard. Diesel boats outnumber gas boats in the PNW for this year. 150 Hino's are the diesel option with US Marine (marinized Chevy 305's) being the standard engine. Interior color schemes with variations of the galley sink thru out the years but overall the same as the 1986's and up. Tramson doors are standard in 1992 models and up. However, many older models have been modified with a transome door by the previous owners. They all have the same hull from 1981-1995 but the cabin appointments are different on the EXPLORERS. 1985 is kind of a transition year for the Motoryacht. 1986 and on are pretty much the same except for power plant options. Transom Door - Older 32xx's (91 and before) do not have transom doors. Many owners have modified their 32xx and added the door. It's a great addition, but a modification best left to a professional. Costs range from 1.5 - 3k. Cockpit Hardtop - Many of the 32xx's in the Pacific North West have a hardtop added to the cockpit. This is basically an extension of the flybridge to cover the cockpit. These owners then enclose the entire rear cockpit providing a good space in cold weather climates. Hull Extension - Some 32xx's have had a hull extension. Most go with a 3 foot extension. The feature provides higher hull speeds, expanded storage and handling. Underhulls - Underhulls are a modification of the standard rounded chine found on the 32xx. The underhulls square the hull chine and make the 32xx much less prone to roll and better handling when running in a following sea. Inverter – Adding an inverter is an excellent way to create 110AC when away from the dock.